Belouch Rugs (also Beluch, Belutch, Belutsch, Balouch, Baloutche, Balúchi) are hand-knotted by different nomadic tribes that wander between Persia and western Afghanistan. (Belouch is a generic term for nomads in that area.) Belouch carpets are closely related to carpets from Afghanistan and Turkamenistan. Their colours tend to be dark red, dark blue, black and brown; their patterns geometrical with curvilinear life-trees. They are often designed as prayer carpets with a prayer niche. 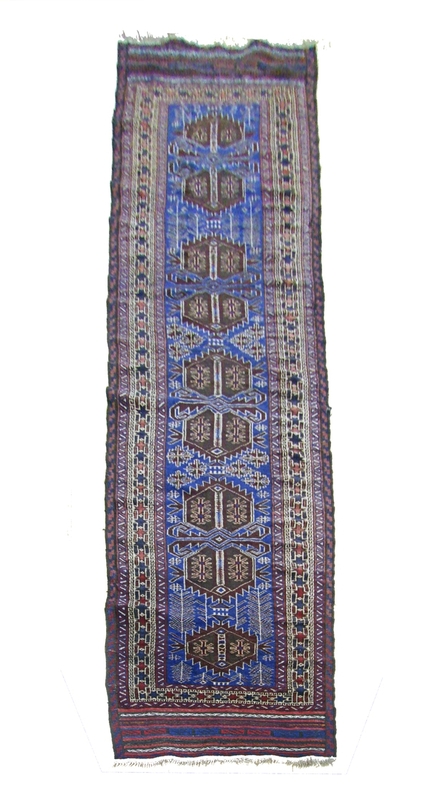 The workmanship is of high quality; these carpets are tight woven, thin and are fine examples of genuine nomadic handicraft. Mashad or Meshed Belouch carpets are sold in the city of Mashad in Iran, while Herat Belouch carpets are sold in the city of Herat in Afghanistan.